50% Sangiovese and 50% Prugnolo Gentile. Finally a Rose! Many of you know that Dale and I are both enamoured with dry Rose. I imagine you wondering “Why haven’t they chosen a dry rose for WINE CLUB?” Now we have! This is a beautiful wine, both delicate and full flavored, lots of complexity, layer upon layer is revealed with each sip. it spends only one hour in contact with the skins while on the press, then is aged for three months on the lees. the dead yeast cells left over from fermentation, this can add nut, bread, and yeast flavours to the wine depending on the yeast. This rose is made with yeast occuring naturally in the winery. The label is cool too, it’s a representation of a rhinoceros from 1515 by Albrecht Dürer, who had never seen one, the woodcut was based on a drawing sent to him by an unknown artist. Notice the armoured plates, curled horn on the back, and scaly legs. There’s no particular connection to the estate, other than head winemaker Giorgio Rivetti being a fan of the illustration. The tech. sheet says to pair with poultry, fish and any type of appetizer, I’d add table water crackers topped with with Prociutto, Camembert, Capers, and thinly sliced red onion, because it’s easy and what we had for dinner last night! This wine is small production, from a multi generation family estate. It’s a direct import from Grassroots, one of the smaller more specialized distributors that we work with. This wine is young, amazing now, but I plan to tuck at least a couple of bottles away at the house for a few years and see where it goes. Wikipedia says that reds from Bandol usually require 10 years of ageing before developing fully. The (adorable, and very informative) website for the Chateau gives this advice: “When young, it is perfect with white meats, later on it is perfect with red meat (roast beef), or with soft cheeses. When it has aged somewhat, 7 to 10 years, it can accompany game, marinated or stewed meat. You should open the bottle 1 to 3 hours before sampling.” I’d lean in the direction of grilled pork and roast beef, rather than chicken. 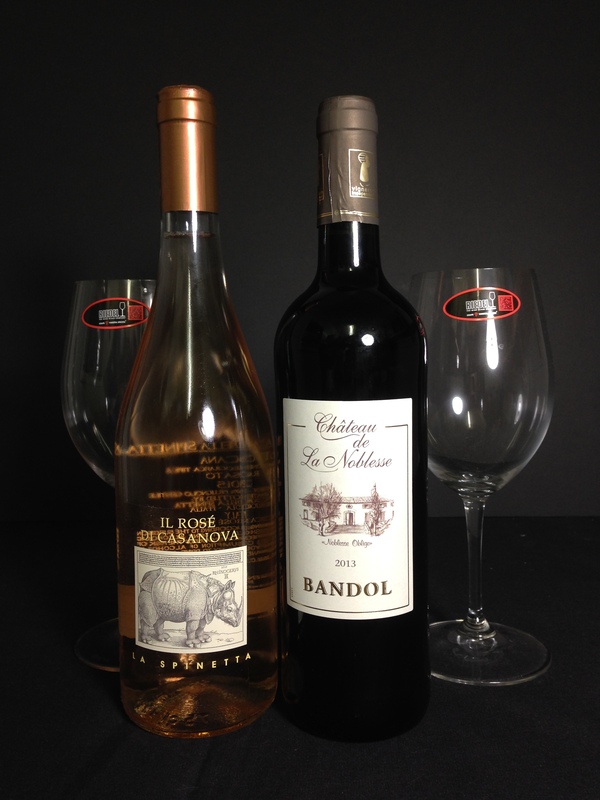 Bandol is in the region of Provence, southeast of Marseilles, near the Mediterranean, Mourvedre, originally a Spanish grape, is the primary red grape of the region and throughout Provence. Full disclosure… I did not open this wine 1-3 hours before drinking, but I swirled A LOT. I would recommend decanting this wine and letting sit around for a bit if you have time. Yum.